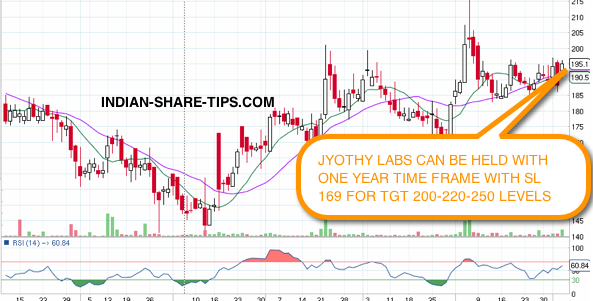 We are bullish on the prospects of Jyothy Laboratories with at least one year time frame which can provide an investor with cool 20-25% returns during the said period. As a strategy one can add this stock in any stock market crash and if one has spare cash then one can add this stock as a systematic investment plan to be on the right side of the entry price in the stock. Thirdly we see a strong operating performance which would result in an exponential growth in the bottom line. However with each optimistic environment a warning comes that its margins may come under pressure due to increased competition and in that scenario it may have to hike its advertisement budget which will affect its profit. 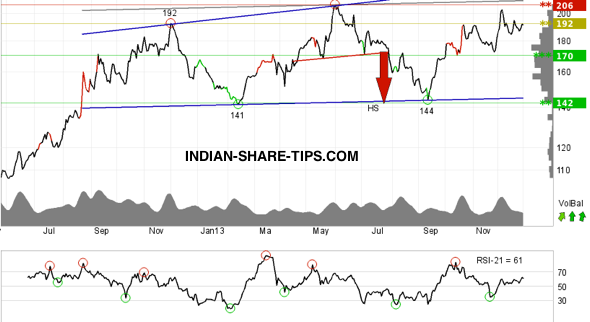 Presently stock is testing the resistance at Rs 192 mark and a break past 192 with volumes means that it will head for 200 mark. Short term movement in stock suggests that volume increase is suggesting a positive bias in the stock for short term. We suggest that one can add this stock to your portfolio and can add more once the stock crosses past the 200 mark with volume and once that happens you can shift your stop loss to the 200 mark. Do not forget to bookmark us for your short term stocks requirement as we are able to deliver up15% returns just by holding the stock for 5-8 days. Last but not least we specialise in intraday tips which deliver stupendous returns in less than 2 hours.